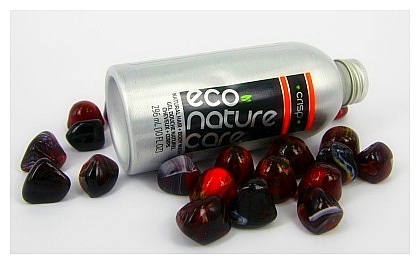 Review: Eco-Nature Care; Natural Hair + Body wash and Natural Re-Conditioner - Cherry Colors - Cosmetics Heaven! 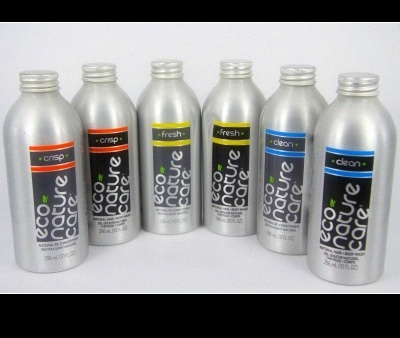 My today's review is about Eco-Nature Care products. I have listed their Shampoo + Body wash & Conditioner on my favorites 2009 list, so I feel I should tell you more about the products. They have a really well-done website, with lots of information! Eco-Nature Care is a company that cares about Nature, tries to reduce waste and at the same time, they want us to be clean and smell great. simple, clean formulas in easy to recycle packaging. We want to make "Natural" relevant again. We believe you can look good and feel good while still being Eco–Conscious. We use Green Chemistry to develop our products to maximize the use of natural ingredients. We use single material packaging (aluminum bottle & cap) to make recycling easier. Our Natural Hair + Body Wash is both a Natural Shampoo and a Natural Body Wash in a combined all–in–one formula. Our all-in-one formula was developed for you to achieve multiple purposes while providing the gentle cleansing you need. The Daily Hair + Body Wash cleans your hair without stripping, leaving no build-up or static electricity and makes your body feel clean and refreshed. AQUA, COCAMIDOPROPYL BETAINE, DISODIUM COCOAMPHODIACETATE, GLYCERIN, XANTHAN GUM, SODIUM LAURYL GLUCOSE CARBOXYLATE, CAPRYLYL/CAPRYL GLUCOSIDE, LAURYL GLUCOSIDE, DISODIUM LAURETH SULFOSUCCINATE, BETA-GLUCAN, SAPINDUS MUKUROSSI PEEL EXTRACT, NATURAL AROMA, CHONDRUS CRISPUS (CARRAGEENAN), GUAR HYDROXYPROPYLTRIMONIUM CHLORIDE, BISABOLOL, CITRIC ACID, POLYSORBATE 20, POTASSIUM SORBATE, SODIUM BENZOATE, PHENOXYETHANOL. Normal Hair: Gentle cleansing for the majority of consumers. Oily Hair: Our gentle cleansers remove as much oil as possible to provide a maximum cleansing without stripping. Our special natural surfactants provide a deep cleansing without harsh clarifying surfactants. Dry Hair: Our gentle 5.5 pH levels create gentle cleansing. We do not feel that the effectiveness of special conditioners could be in the Shampoo but in the conditioners where they have longer to stay in your hair. Use our gentle conditioner after shampooing and follow the directions for dry hair. 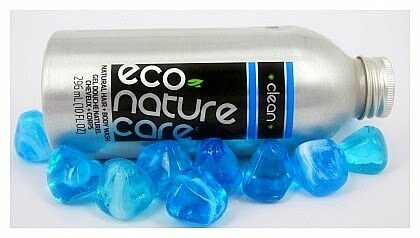 Pour two tablespoons of Eco–Nature Care Hair + Body Wash into your palm and rub hands together. Apply Hair + Body Wash into your wet hair, massaging scalp with fingertips in a rotating motion. Work the gentle cleansing lather thoroughly through your Hair + Body. Rinse thoroughly and repeat if desired. Our special formulated Re-Conditioner is designed to add moisture to the hair and scalp, soften the hair, increase luster and prevent tangling. Our Re-Conditioner accomplishes these tasks without feel greasy or heavy. We have accomplished this effective formula by using Green Chemistry guidelines with natural ingredients. We have specifically created a conditioner that is formulated for all hair types and can be used as a leave-in conditioner. We are trying to simplify your natural hair care by reducing unnecessary products and packaging. AQUA, BEHENTRIMONIUM METHOSULFATE, CETEARYL ALCOHOL, CETYL ALCOHOL, HYDROXYETHYLCELLULOSE, SORBITOL, TRITICUM VULGARE (WHEAT) GERM OIL, OLEA EUROPAEA (OLIVE) FRUIT OIL, TOCOPHEROL, PANTHENYL TRIACETATE, VEGETABLE OIL, NATURAL AROMA, BISABOLOL, PANTHENOL, CITRIC ACID, ETHYLHEXYLGLYCERIN, PHENOXYETHANOL. 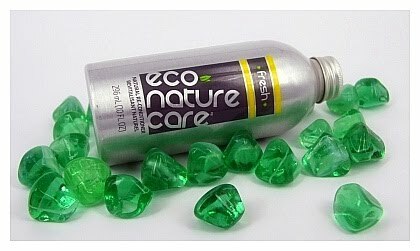 Pour 2 to 3 tablespoons of Eco–Nature Care Re–Conditioner into your palm and rub into your scalp. Pull the re–conditioner from the base of your hair to the ends ensuring complete coverage. Allow the conditioner to stay on your hair to achieve the desired benefits of soft, manageable hair. The duration of the time allowed on your hair depends on your hair length and type. For Normal Hair — Leave in for 2–3 minutes. For Dry Hair — Leave in for 3–5 minutes. Our conditioner can be used every day. Leave the re–conditioner on the hair for the duration recommended and be sure to rinse well with lukewarm water. For leave–in just leave in and rinse out the next day. I have all three sets of their products, and I must say that the scents are divine. They come in Crisp, Clean, and Fresh. Out of all three, Crisp was my favorite scent. But then again, the scents are amazing, so I'm pretty sure that they would suit anyone. Don't worry, the scents are Unisex. 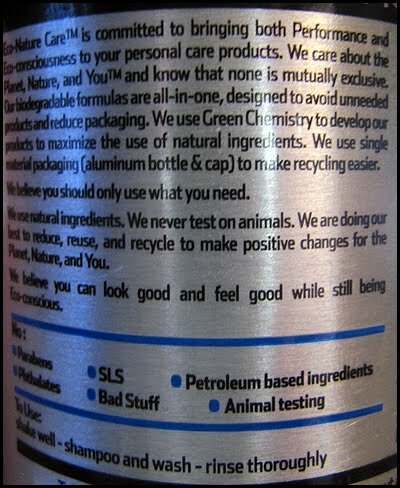 The products come in 296 ml bottles made of aluminum. They look really pretty with their logo printed on the front side and all the information on the back side. The information is written in English and French, I suppose that is so because it is made in Canada. The bottle itself is quite heavy compared to plastic bottles, and the bottle opening is quite big too. Okay on the picture it seems a bit bigger, but honestly, it is just as big as the opening of your water/soda bottle. That is one of the reasons why the handling with it at first tricky, but once you get the handle of it, it's so much easier. I must say that being a clumsy person that I am, has made me worry that with this bottle I will probably break something, but the truth is that nothing bad happened! I was extra careful during shower and bath time to not drop it, but then I realized that since it is aluminum, the max that can happen is a bump or two on the bottle. It is transparent with a bit of yellow color in it. It feels like a gel, because to the opposite to your regular hair wash (and body wash) it is less runny. I must say that I had lots of fun because of its consistency. 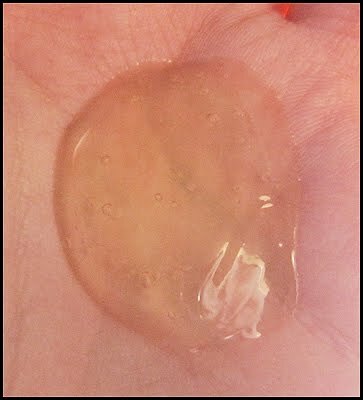 Don't get me wrong, the closest thing that it reminds me of (except gel) is the blob. Fun! It does leather really well, so a little goes a long way, especially for hair wash. I used it mostly for my hair, and it left me with clean hair that smelled divine for a day or so after. Usually, I had to wash my hair every second day because all the shampoos I've been using have stripped my scalp of its natural oils, but with this, I can prolong the hair washing time to three days. So for me, this is a winner. I used it for my body a couple of times, and it did its job really well, but I still prefer using it for my hair. The use is really simple; You take the bottle and pour some of the product in your palm. If too much product came out, you just put it back into the bottle - you make a cup with your palm and pour back in the amount you want. This one is more similar to other conditioners. It's creamy and white. I use it for 2/3 of my hair, except the scalp. I rarely use conditioner on my scalp, because my scalp gets oily pretty quickly. I really like it, it is easy to work with and leaves me with silky smooth hair. And believe me, having dry, thin and wavy hair isn't easy. I must say that no matter what conditioner I used, my hair would become fuzzy the next day. But with this - nothing! Amazing. Getting it out of the bottle is a bit of a tricky thing. 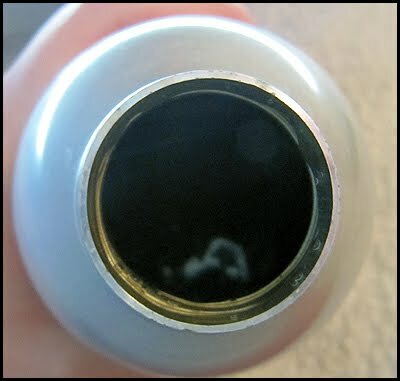 It is not even close to runny, so you have to tap the bottom of the bottle. But that is a bit of a time consuming, so I just grab the bottle, put my palm over the opening and shake it lightly. And ole' here you have your conditioner. Overall: I really enjoyed these products (I have still plenty left), but it saddens me that they aren't available to purchase anywhere else except in the USA & Canada. The Body wash & Shampoo worked really well for my hair, which is really great because I was looking for THE Shampoo for a very long time. I especially like that the products are SLS-Free and are Eco-Friendly.I think everyone should be Eco-conscious and buy items that won't ruin our planet with their package. The scents are fantastic (I can't stress that enough), tho it may be a bit tricky to get the product out of the bottle (Re-conditioner), but overall I love them and would recommend them!